Contraband Corvette Club forms a sub club with National Council of Corvette Clubs (NCCC)! Click on picture below to visit Facebook page for the new performance driving group! 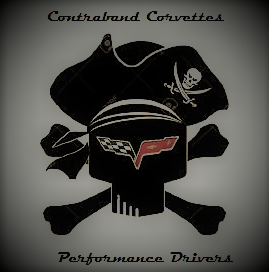 The Contraband Corvettes Performance Drivers share many members and activities with their parent club, the Contraband Corvette Club. CCPD exist to focus more on driving events than social events. We participate in autocross, track racing, road rally, high performance driving, and driver training programs designed to allow Corvette owners to push their cars to a higher level in a safe and controlled environment. The National Council of Corvette Clubs, Inc. (NCCC) was founded in the United States as an all volunteer, non-profit organization in 1959 by a small group of Corvette owners/enthusiasts! In 2009 we celebrated our 50th Anniversary and look forward to many more years of fellowship. The purpose of NCCC was (and still is) to promote interest in Corvette ownership and operation, to publish information on the use and operation of the Corvette and to establish an organized effort to encourage others to participate in the enjoyment connected with the use and ownership of the Corvette ~ America's Sports Car! Through the NCCC clubs and members can access numerous benefits, including a multi-million dollar insurance policy for approved and authorized events.